The 2017 / 2018 flu season is to predicted to be one of the worst on record. The flu started appearing in Florida as early as the beginning of September with several confirmed cases. The CDC has recently come out with its Frequently Asked Flu Questions 2017-2018 Influenza Season. Click to read their FAQ’s for the upcoming flu season. 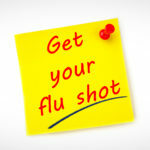 Its not to late to come in and get your flu shot.